Birmingham City have released an official statement of apology to Aston Villa and Jack Grealish after today’s fan attack in the Second City Derby at St Andrew’s. 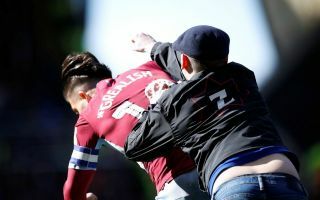 In a remarkable incident early on in the game, Villa star Grealish was attacked by a fan who ran onto the pitch, who somehow managed to get right up close to the player and punch him around the head. The 23-year-old shook this incident off well though, as he went on to score the winning goal against Birmingham in a pretty incredible game. In celebrating his fine strike against the Blues, Grealish was once again targeted by a steward, who had to be dragged away by police after appearing to kick and shove the player. Birmingham have now apologised and promised that the fan in question will receive a lifetime ban for this senseless attack, which certainly has no place in football or society as a whole. It’s good to see the club respond quickly to this, but they also surely need to step up security measures as this fan was allowed far too close to Grealish and could easily have done something much worse.